CBS Maritime's research is organized into a number of interacting projects with a common reference to the dual relationship between “maritime industry dynamics” and “increasing global integration”, but each with their own outline and sub-projects. Below are examples of the central questions being addressed. Some of the projects are funded by the EU 7th framework program (FP7), the Joint Committee for Nordic Research Councils for the Humanities and the Social Sciences (NOS-HS), Canada's Social Sciences and Humanities Research Council (SSHRC), the Danish Maritime Fund, DS-Orient's Fund, and the Lauritzen Foundation. The need for shipping business innovation is well recognized in the maritime industries and by the relevant policy-makers. However, there is a predominating technology bias with attention to achieving first-mover advantages in the development of new products, services and production technologies and overall inattention to organization-oriented innovations. There are important lessons to be drawn from a focus on organizational innovations, as research has shown that such a type of innovation is what separates successful from less successful companies over time. The present CBS Maritime research initiative addresses organization-oriented innovations in shipping, ports and maritime industry. More specifically, the initiative focuses on 1) strategy innovation, which is considered as the capacity of a company to reconceive the existing industry business model in ways that create new value for customers, outmaneuver competitors, and produce new wealth for all stakeholders, and 2) management innovation, which entails all efforts to install new management processes, new management tools and new organizational structures. The initiative is generously co-funded by DS-Orient’s Fund and comprises of a number of individual projects, covering different aspects of strategy and management innovation in shipping, ports and maritime equipment suppliers. What factors are driving environmental sustainability in the maritime supply chain? How and why is there variance in response, i.e., leaders versus laggards? What are the roles and implications of sustainable shipping policies to actors along the maritime supply chain? How can greater sustainable shipping policy coherence be achieved to maintain competitiveness, spur innovation, facilitate consistent implementation, engage external stakeholders and ensure environmental progress? CBS Maritime together with the Centre for Transportation Studies (UBC Sauder School of Business) manages an international maritime research project with the aim to explore governance challenges and opportunities in relation to a sustainable maritime supply chain and answer the above questions. The project addresses five interrelated themes with the aim to answer questions such as the above: 1) Trade & Logistics Governance, 2) Green Port Governance, 3) Corporate Governance, 4) Stakeholder Governance, and 5) Value Chain Governance. The project is funded by the Social Sciences and Humanities Research Council of Canada and brings together economists, management scholars and political scientists and also has participation by partners from industry and government. For a broader reflection on the project, please read the HRAS interview with Henrik Sornn-Friese. Like other industries, the maritime industry is experiencing commoditization, where marine equipment products become more similar from a buyer’s point of view due to the increased global competition. Commoditization has penetrated into the industry in depth and breadth, affecting both sides of the maritime value chain: equipment suppliers and ship owners. Both parties are challenged by the traditional "price" tag mentality, where suppliers strive hard to engage customers with the best price while ship owners still rely on the easy-and-fast price judgment to decide which vendor they want to have, for what period, and for what kind of products. This leads to an unsustainable business model, where ship owners focus on squeezing the price tag and suppliers focus on minimizing cost. To beat the commoditization blues, servitization is seen as a way to resume growth and sustain long-term competitiveness. It upgrades the existing manufacturing competences by adding value-added services to their traditional product offerings. Particularly in the wake of the fourth industrial revolution, servitization represents not merely goods and service bundles but also the technological-advanced sales with complex contract-based price, cost and profit schemes. Price and cost - Building up the competencies of suppliers in pricing practice and cost management of product-service solutions by considering market, design, life cycle and value chain; and building up the competencies of ship owners to strategically select the reliable supplier, product and service. Contracts - Establishing new specific knowledge about how contracts can enable the transformation from one-off transactions to long-term collaboration between supplier and ship owner that encourages innovation and technical development by e.g. ensuring balance between risk and reward. Financing - Creating specific insights into understanding how to link scale, profitability and financing of servitized solutions for the industry. Open seminars - The project is organized around a series of seminars with participants from Blue INNOship projects, maritime industry and universities. Each seminar focuses on a particular theme relevant for the project, offering a theoretical introduction of the theme and more importantly addressing its relevance and importance for the industry. All industrial practitioners and researchers that are interested in the seminar theme or a possible collaboration are invited to the seminar. Below you can download the seminar invitation together with the program, presentations and also the following reports in connection with the seminars being conducted. 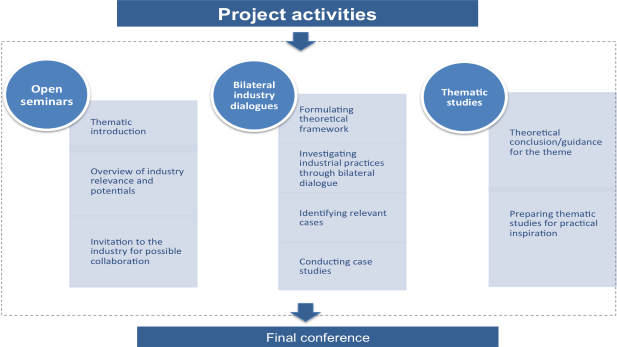 Bilateral industry dialogue – In parallel with the planned seminars, bilateral dialogues with industrial partners are made to investigate the industrial practices and current challenges, and to further identify relevant cases and possible solutions. These industry interactions will ensure the project can best address the industry’s needs, and companies can also gain access to the project’s latest research discoveries. A strong knowledge base for specific themes will also be built through these engagements. Thematic studies – Findings in seminars and bilateral industry dialogues will be elaborated further and summarized in the thematic studies for theoretical guidelines and practical inspiration. Product and service innovation are critical success factors for the maritime equipment manufacturers and service providers. However, firms must also be able to successfully commercialize an innovation in the market. One of the key challenges faced in commercialization of new products and services is how to set the price and cost. In today’s competitive market environment, it can be difficult to implement the traditional cost-plus pricing strategy, because prices are increasingly determined by market forces rather than by simply marking up the cost with a sufficient profit. Costs must also be carefully managed to create profit and to achieve certain market penetration objectives. To ensure the commercial success, target costing can be applied to integrate the commercial market with product and service innovation. Starts with understanding the market, target costing creates the opportunity for cost and profit planning at the early stage, thus ensuring that the product or service is both desirable and affordable to the customer and profitable to the manufacturers or service providers. Target costing has been adopted by a number of leading firms across the world. It is also relevant for the Blue INNOship projects in general and the Danish maritime equipment manufacturing industry in particular. During this seminar, we would like to engage you on this superior tool and to discuss how Target Costing can improve the competencies of cost management and profit planning for the Danish maritime equipment manufacturing industry. This open seminar introduces the pricing strategy, the implication of cost-plus strategy and the common challenges experienced by the practitioners. This seminar focusses on how to combine the business strategy with the contract by introducing the use of relational contracts in a servitization perspective. Tentative list of the seminars can be found below. The list can also be adjusted with the close dialogue with the industry. This material is part of the on-going research activities about understanding the market through analysis of price, cost, contracts and finance in the Danish maritime equipment manufacturing industry. Copenhagen Business School (CBS) and Danish Maritime are project partners in the project, which is part of the Blue INNOship programme and supported by the Innovation Fund Denmark and The Danish Maritime Fund. For further information please contact Associate Professor Liping Jiang on email lji.om@cbs.dk or Head of Department Carsten Ørts Hansen on email ch.om@cbs.dk. How can maritime companies manage the risks and costs associated with adapting their strategy and organization to new global market opportunities and conditions? How can they distinguish between and capitalize on new global opportunities in such a way as to achieve long-term (sustainable) competitive advantages? In 2014 CBS Maritime launched an ambitious maritime research program with the support and generous co-funding of the Danish Maritime Fund to address these broad questions. The research program encompasses seven PhD projects and five shorter mapping projects, each affiliated with a number of active dialogue partners from the maritime industry. For further information view the CBS Maritime news section or contact Carsten Ørts Hansen. How can we explain the recent success of the Danish shipping industry? Why has it been so effectively able to gain from the opportunities of world trade since the mid-1990s so as to obtain European maritime leadership? Researchers from CBS Maritime have addressed these questions, asking whether the sources of Danish maritime success are to be found within the major Danish shipping companies in the form of capabilities; at the country-level in the form of particular comparative advantages; or at an intermediary level in the form of sector-specific (or maritime cluster) mechanisms. In a published article they conclude that the sources of recent Danish maritime success can be properly explained by integrating these different explanations and including the international dimension as well, and by accounting for how these mechanisms interact (H. Sornn-Friese og M. J. Iversen, 2011, "Incentives, Capability and Opportunity. Exploring the Sources of Danish Maritime Leadership", International Journal of Maritime History, 23(1), s. 193-220). With permission from the journal, The Danish Maritime Fund has reprinted the article in the leaflet Vækst i Det Blå Danmark (Copenhagen, 2011), where it is commented by Leif Beck Fallesen in the article "Det Blå Danmark hjælper Danmark gennem krisen" and by Torben Juul Andersen in the article "Lessons from Corporate Leadership in the Danish Maritime Sector". How entrepreneurial are ex-seafarers? What does experience from a life at sea mean for the patterns of entrepreneurship (new company formation) in shipping? What are the main factors determining the choice of settlement for seafarers going ashore? These are important questions for understanding the societal impact of a national maritime skills-base based on national seamen and ship officers and for understanding the dynamics of maritime entrepreneurship. In her PhD thesis from 2013 Co-worker Influence and Labor Mobility. Essays on Turnover, Entrepreneurship and Location Choice in the Danish Maritime Industry, fully financed by the Danish Maritime Fund, Christine D. Isakson has demonstrated that the social relationships being formed between seafarers on board ships have a major influence on those seafarers’ choices regarding changing jobs, founding their own company and where to settle. Is there a particular “Nordic model” of shipping? How did shipping develop in the Nordic countries in recent times? Much of this project was carried out in collaboration with colleagues from different universities in the Nordic countries. Researchers from CBS Maritime has together with colleagues from Norway, Sweden and Finland addressed these and related issues in the book Global Shipping in Small Nations. Nordic Experiences after 1960 (Palgrave-Macmillan 2012). The project was co-funded by the Joint Committee for Nordic Research Councils for the Humanities and the Social Sciences (NOS-HS).